It’s no surprise the hit Starz show Outlander is one of the most talked about shows right now. The show is hard to pin down to a genre and will appeal to you whether you enjoy historical fiction, time-traveling science fiction, fantasy, or romance. Outlander is all the best parts of these genres in one show. Anyone can start watching every episode of Outlander for free with this one-week free trial to Starz. Outlander is based on the book of the same name by Diana Gabaldon. The show stars Caitriona Balfe as Claire Randall, a married nurse during World War II, who time travels to Scotland of 1743. There she where she meets Highland warrior Jamie Fraser (played by Sam Heughan) and becomes embroiled in the Jacobite rebellion against the crown. 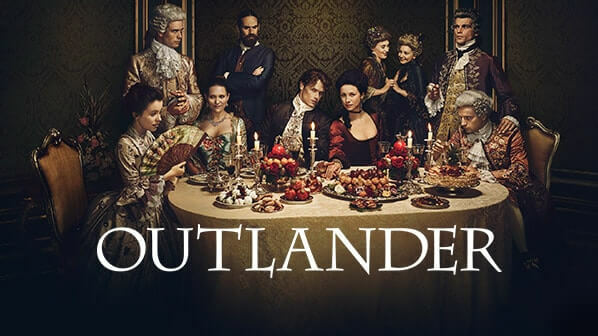 So if you enjoy the idea of the intrigue that surrounds the Scottish rebellion against the British throne, or a woman torn between two men from vastly different centuries, or both then I strongly recommend you check this show out. The Season 4 premiere is Sunday, November 4th, 2018 at 8 pm. Season one premiered in 2014, but the show is so good it’s been guaranteed at least a season 5 and 6. So if you haven’t seen it, now is the best time to start the binge which is easy even if you don’t have cable. I explain where to watch below. Outlander is currently the biggest show on Starz. Many assume you can only watch Outlander if you have a cable TV subscription that includes Starz. However, that isn’t the case. Here are all the places you can watch Outlander without having cable TV. You no longer need cable TV to watch Starz. Anyone can subscribe to Starz and watch Outlander using the Starz App. Simply sign up for your 7-day free trial to Starz and you can start watching Outlander right now! Every episode of the past 3 seasons are currently available on demand and you will be able to watch Season 4 live when it premieres on November 4 at 8 PM. After your 1 week free trial, Starz will only cost $8.99 per month and you can cancel any time as there is no contract. The Starz App is supported on Roku, 4th Gen Apple TV, Amazon Fire TV, Roku, Android TV devices, and modern browsers. You can also use the Starz App on iOS and Android tablets and phones. Your iOS device is also a way to use watch Starz on your old Apple TV via Airplay. This also works with an Android device and Google Chromecast. If you already subscribe to any streaming services like Hulu, Sling TV, Amazon Prime, or DirecTV Now, you can add Starz to your existing subscription. I explain how to do this in our guide on How to Watch Starz Online without Cable. The guide will give you step by step instructions for adding Starz to each of those services. If you were so inclined, you could purchase each season of Outlander from a service like Amazon, iTunes, are Google Play. However, it’s much more affordable to just pick up the free trial to Starz and binge watch the show.